"The Proposed Chrystie-Forsyth Parkway." A. J. Frappier, delineator, 1931. The Regional Plan of New York and Its Environs (RPNY), today known as the Regional Plan Association (RPA), was one of the earliest and most influential groups of planners to focus on the future development of the metropolitan region. 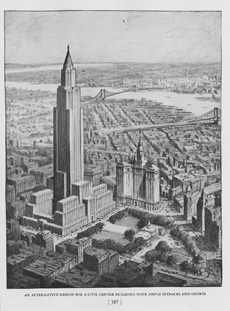 Founded in 1921 by Charles Dyer Norton and funded by the Russell Sage Foundation, the RPNY began a wide-ranging, although somewhat scattershot analysis based on the pro-centralist assumption that New York City would remain the economic engine for the region. In 1923, as planners began to collect demographic data and make maps, Norton organized several committees of prominent New York architects to propose and visualize physical improvements throughout the city. The committee on traffic studies, chaired by Harvey Wiley Corbett, studied innovative ways to relieve congestion in the central business districts. Corbett proposed segregating and layering traffic: rail lines would run underground, vehicles at street level, and pedestrians above on elevated sidewalks, as illustrated in the drawings above. "An Alternative Design for a Civic Center Building with Ample Setbacks and Courts." Chester Price, 1931. When Norton died suddenly in 1923, the British planner Thomas Adams became the new director and took a more analytical, social science approach to planning. Although the architects' drawings were included in various RPNY publications from 1925 to 1931, Corbett's proposals for multi-level traffic separation were not energetically promoted. The RPNY focused more on lowering street and building densities. Renderings created in the later twenties were more streamlined in architectural style. 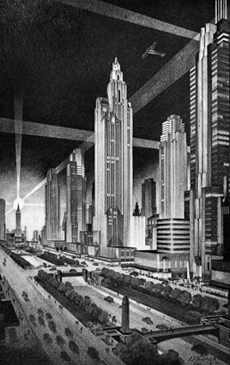 Still, the penchant for monumental scale persisted, as in the 1931 superblock civic center at right, drawn by Chester B. Price in 1930.